The Fall Fish Festival will take place at the Taylor Creek Visitor Center on Saturday and Sunday, Oct. 7 – 8, from 10 a.m. until 4 p.m. each day. The Taylor Creek Visitor Center is located on California Route Highway 89, 3 miles north of South Lake Tahoe.The festival is an opportunity to learn about the variety of fish species that live in Lake Tahoe and its streams including the federally threatened Lahontan cutthroat trout.On Saturday, the U.S. Fish and Wildlife Service’s giant inflatable fish will serve as the gateway to fun activity stations for kids. Saturday and Sunday festival mascots Lulu the Lahontan Cutthroat Trout and Sandy and Rocky Salmon will make appearances and there will be special appearances by Smokey Bear. As the trees begin to change colors in Lake Tahoe, so do the salmon. Taylor Creek, one of the alpine lake’s 63 tributaries, is flush with bright-red kokanee salmon swimming upstream for spawning. “They are turning from blue-silver, which they are in the lake, to red. 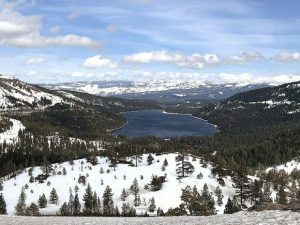 It’s a biological thing they go through during spawning,” said Sarah Muskopf, aquatic biologist for the U.S. Forest Service Lake Tahoe Basin Management Unit. The males turn a deeper red than the females and develop a hump on their back, a hooked jaw and sharp teeth. Sensing the cooler water flowing from Taylor Creek and smelling the waters of their birth, the kokanee begin making their way up the 2-mile stream. “When they get to the area where they’d like to lay their eggs, which is called the redd, the female will start to dig a hole with her tail in the gravel. Usually they are about 4-inches deep,” explained Muskopf. Having stopped eating, the female dies a couple of days after laying her eggs, while the male can live up to two weeks to protect the eggs. “A female can lay anywhere from 400 to 1,200 eggs, but only about 1 percent survive,” said Muskopf. 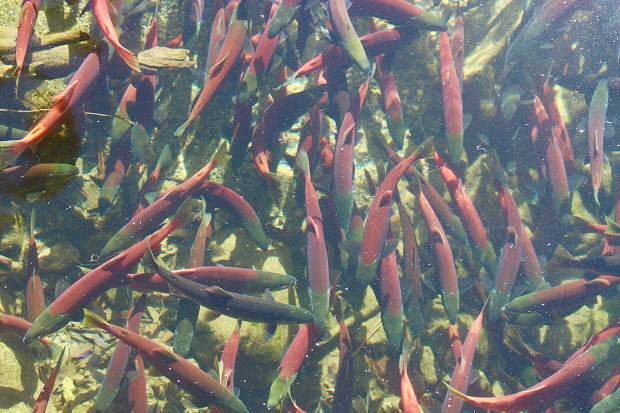 After growing to maturity — about 14 inches — the landlocked version of the sockeye salmon will return to its spawning grounds to continue the cycle. The kokanee is non-native to Lake Tahoe and was “accidentally introduced” into Lake Tahoe during the ’40s from a hatchery on the North Shore. “At that time they were experimenting will all sorts of non-native fish stocking in Lake Tahoe. Some of them were not successful, but in this case is was an accidental introduction and three years later kokanees were coming back to that area to spawn, so they started annually stocking kokanee in the late ’40s early ’50s,” said Muskopf. Today, the California Department of Fish and Wildlife stocks Lake Tahoe with approximately 150,000 fingerling salmon every May. The total population of kokanee salmon in the lake is unknown, but this year the department partnered with several fishing guides who will provide catch numbers for the salmon as well as other species like lake and brown trout. But biologists do know that the population of salmon in Lake Tahoe has been affected by the drought conditions. “Not this year, but in previous years we’ve had pretty significant drought conditions where we were seeing hardly any fish in Taylor Creek, but we started seeing them in other tributaries,” said Muskopf. 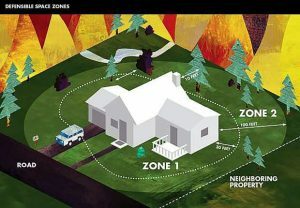 Significant rain or snow could wash away the eggs, while low water conditions could impact the level of oxygen the eggs receive or create otherwise difficult conditions. From start to finish, the spawning can last anywhere from four to six weeks, meaning visitors should be able to stroll along the newly constructed boardwalk at the Taylor Creek Visitor Center to view the salmon run into November. The spawning also attracts another kind of visitor: hungry black bears. In anticipation of hibernation, black bears can be found at Taylor Creek stocking up on fatty salmon for the winter ahead. The Fall Fish Festival is slated for Oct. 7 – 8 at the Taylor Creek Visitor Center. The family-friendly event offers many educational and entertaining fish-themed activities for all ages.